Have you ever noticed that children’s cartoons often have very adult messages? 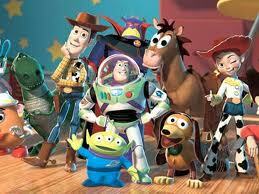 Recently my niece has fallen in love with the characters of Disney Pixar’s Toy Story. When she isn’t watching the three animated movies, she assumes the role of Buzz Lightyear, running through the house declaring, “To infinity, and beyond!” When I first saw the movies I loved the heartwarming, and often comical, story. Now having seen the movies more times than I can count, I’ve realized that they are much more than the favorite cartoon of my three-year old niece. Through the eyes of a few toys, the human heart’s longing for purpose becomes clear, and I think, the answer to where that longing is found. As Buzz, Woody, Jessie, and the rest of the toys face their insecurities surrounding their ‘toyness’ and worth, we face with our own human longing for purpose. For example, in the first movie Buzz Lightyear has no idea he’s a toy, believing he’s actually a space ranger on a mission to protect the galaxy. As the story unfolds Buzz discovers who he really is to the undoing of his understanding of reality. Buzz had to learn that his purpose and worth was found in fulfilling the role he was created for. He was a toy created for the purpose of being loved and played with by a child. His meaning was found in acknowledging his toyness. As he embraced this reality he found joy, contentment, and peace. When Buzz accepted the love of the child he was made for he found the significance he longed for. I wonder how often we are like Buzz Lightyear. We have grand ideas and plans surrounding our identity and purpose. Yet there inevitably comes a point in life when we’re confronted with the reality that we’re not all we thought we were. We’re not capable of what we thought we could do. And like Buzz, we’re overwhelmed with our smallness and seeming insignificance. Like Buzz we need to discover our created purpose, our reason for being. Because it is only when we fulfill our created purpose that we find true contentment and peace. Buzz found his worth in accepting his created purpose of being a beloved toy. Likewise, we need to find our worth from accepting our created purpose. We were not created to rescue the galaxy. We were made for so much more. Where is your heart seeking its worth and rest? This entry was posted in Movies, Philosophy, Theology and tagged Movies, philosophy, Theology, Toy Story by Sarah. Bookmark the permalink. Thanks for this post! FYI I will be borrowing it for our youth group’s lesson series on movies! I’m glad it was helpful! !